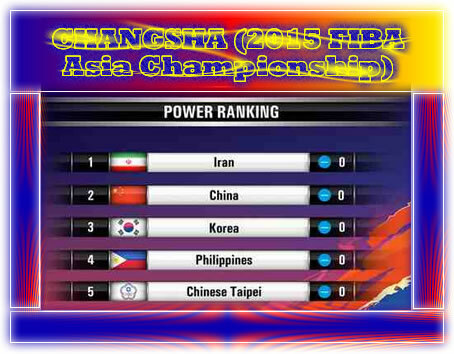 CHANGSHA (2015 FIBA Asia Championship) - In the lead-up to the 2015 FIBA Asia Championship on September 23, FIBA.com experts will be ranking the 16 teams bound for Changsha, China, based on their respective player compositions and preparations for the biennial tournament. FIBAdotcom. Though these rankings are entirely based on out experts' opinions and have no mathematical or theoretical grounding, keep in mind that player injuries, eligibility issues, training camp reports, and pre-tournament game results will all have considerable impact. Iran are the defending champions. Team Melli is expected to be very strong again this year with the same old faces doing the same amount of damage to their foes. 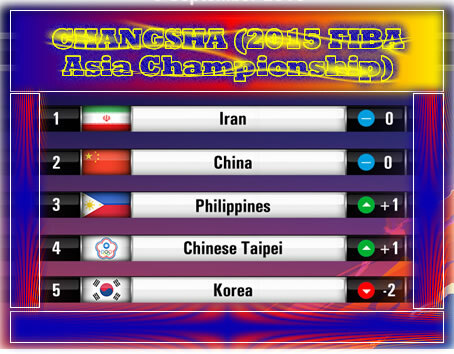 Yes, Iran got beaten by China's B Team twice a couple of weeks ago, but they have remained healthy as of late. They have also been dominant in the 2015 William Jones Cup, winning their first four games by an average of 24.3 points. China have been training since March, and the injuries might be taking a toll. As of now, star player Yi Jianlian is still resting and has not yet rejoined the team. Still, this team maybe has the biggest size in the field, and they have homecourt advantage throughout the entire tournament. China is renowned for playing a notch or two better at home, so they are in great shape. Also, an upcoming 4-nations tournament with Jordan, Lebanon, and the United Arab Emirates (UAE) will help. The Koreans went 1-1 against Chinese Taipei in two tune-up games, losing the first game by 3, but then proceeding to blow Chinese Taipei out in the second game. Korea’s strengths are supposed to be its depth and consistency, but these haven't been in full display in the 2015 Jones Cup, where the team has lost two of five games. Despite half of the team that played in the 2014 FIBA Basketball World Cup missing, the Philippines got a big boost this past week with the possibility of LA Lakers guard Jordan Clarkson suiting up. Their trip to Estonia yielded a lot of learnings, and they have racked up some impressive wins in the 2015 Jones Cup. Momentum seems to have swung, and things are improving for Gilas Pilipinas. A win over the Koreans has done wonders for Chinese Taipei's current level of confidence, and they have been playing quite well at home in the 2015 Jones Cup. They are relatively healthy (save for an injury to Jet Chang), and are primed to be a sleeper contender when the FIBA Asia Championship begins. One knock, however, is the possibility that this may be star playmaker Lin Chih-Chieh's final campaign with the national team. The Snow Leopards are currently in Lithuania for their training camp and tune-up games. Big things are expected from this team after they finished among the top four in last year's Asian Games WITHOUT naturalized guard Jerry Johnson. With him back in the fold and with training in full swign, things should continue to look up for the Kazakhs. Loren Woods has been the confirmed naturalized player for the Cedars, and he looked solid in their tune-up games in Europe. This dampens the worries connected to his age and the fact he is fresh from an injury that sidelined him for much of the past LBL season. The rumors about Fadi El Khatib's having trouble securing a release from his CBA squad persists, though. There is palpable excitement about this Japanese team, especially with former NBA player Yuta Tabuse leading the pack. Good results against a Czech Republic select team augur well for the team, and though their Jones Cup campaign hasn't been spectacular, there are noticeable flashes of brilliance. Of course, not having star big man Kosuke Takeuchi still hurts..
Coach Rajko Toroman had to cancel an international training camp for his boys because of budget constraints, but that doesn’t mean Jordan won't be a force to be reckoned with. With veterans Zaid Abbas and Sam Daghlas back to lead the team, look for Al Nashama to be a tough nut to crack again this year. Also, they have confirmed participation in a 4-nations competition in China next week. Iconic player Yaseen Musa has officially retired and top local PG Mansour El Hadary still doesn't look fit enough from his ligament tear injury. Tired old veterans like Erfan Ali Saeed and Daoud Musa Daoud will have to carry the slack along with emerging scorer Khalid Suliman Abdi and returning naturalized player Trey Johnson, who looks half a step slower than he used to be. I’m excited to see the Palestinians play in their first-ever FIBA Asia Championship, but I’m not too excited about their chances. They are good enough to place second in Group B, but every game after that is going to be a major uphill battle. With Omar Krayem and Nicola Fadayel back in the team, however, this may just be the best Palestine team ever assembled. India were supposed to explode into prominence this year, but the departure of Scott Flemming and Satnam Singh Bhamaras decision to focus on his NBA prospects both cast a shadow over India’s chances of making a dent in #FIBAAsia2015. Still, if the terrific trio of Vishesh Bhriguvanshi, Amjyot Singh, and Amrit Pal Singh can play really well, anything can happen. Nothing much from this Gulf nation, but their not-so-bad showing in the 2014 Asian Games promises that they will be, at the very least, a competitive bunch who should still make it out of Group B ahead of the teams below them here. Watch out for spitfire guard Ahmad Al Baloushi. Even at full strength, Hong Kong will have a lot of trouble in Group B, but I’m not even sure if key guys like Lo Yi Ting and Lee Ki will play. Guys like Duncan Reid and Chan Siu-Wing will need to step up. Needless to say, Hong Kong will not be expected to make any ripples in the big tournament. Fresh from winning the bronze medal in the 2014 SEA Games, Singapore’s confidence is at an all-time high. That, however, will not be enough for them to beat any team in Group C.
Filipino coach Paul Advincula recently proclaimed that his boys are ready and won’t back down from any challenge in #FIBAAsia2015. That’s a good attitude to have for a team that, in all possibility, may finish dead last. FIBAdotcom. In this edition of the Power Ranking, many of the teams have already had more than a few tune-up games, with a handful actually playing in the 2015 William Jones Cup. Several teams have also finalised their 12-man rosters for the FIBA Asia Championship, and this should give us a clearer picture of where they stand. Iran just buried the competition in the 2015 William Jones Cup, winning all but one of their games en route to annexing the championship. Both Hamed Haddadi and pint-sized Mahdi Kamrani were also named to the tournament’s Mythical Five. This bodes well for the defending champions, who are expected to dominate the proceedings once again in Changsha. Oh, and did we mention that the team’s top forward, Samad Nikkhah Bahrami, didn’t even play? China have been quiet of late, choosing to hold training camp at home after a series of tune-up games abroad. Yi Jianlian’s tired body is recovering nicely, but promising young playmaker Liu Xiaoyu appears to be sidelined with a stiff back, which is probably why he was left out of the final 12-man team. With Yi playing alongside Wang Zhelin, Zhou Qi, and Li Muhao, coach Gong Luming easily has the biggest team in the competition. The Filipinos move up one spot owing to their inspired play in the Jones Cup, where they won six of eight games and finished second overall. And they did that WITHOUT Andray Blatche and Jordan Clarkson, who is still seeking a release from his NBA club to join the Philippine national team. Coach Tab Baldwin has proven before that he can bring the best out of any player under his wing, and that is slowly shaping up to be the case in Manila. Chinese Taipei placed on the podium in the Jones Cup right behind Iran and the Philippines, and they are set to have one more pocket tournament by the week’s end. It sure looks like coach Chou Jun-San is leaving nothing to chance as his team are in the tournament’s toughest preliminary group and are pressured to build on their top four finish in 2013. The Koreans were very inconsistent in the Jones Cup, eventually winding up in fifth place. Swingman Yoon Ho-Young looks doubtful for the FIBA Asia tourney, and star guard Kim Sun-Hyung has been suspended for suspected involvement in game-fixing issues back home. It hasn’t been the best of weeks for this perennial powerhouse, which is why they slide two spots. Jordan are fresh from a two-game bashing of West Asian rivals Palestine, and are set to join a four-nation pocket tournament in China. Stalwarts Zaid Abbas and Sam Daghlas reportedly didn’t even play in their twin wins over the Palestinians, so their addition in China should make coach Rajko Toroman’s squad that much stronger. Japan had a very slow start in the Jones Cup, losing their first five games, but they regained their bearings and wound up winning two of their last three assignments to avoid the cellar. There is much improvement to be done, sure, but one has to love the fact that despite not having star center Kosuke Takeuchi and having no naturalised player, Team Hayabusa continues to compete and put a scare in other teams. The Kazakhs are still reportedly in basketball hotbed Lithuania, honing their skills and sharpening their shooting away from the prying eyes of their continental opponents. That should serve them well once they get to Changsha, where they are bound to encounter very tough opposition in the tournament’s Group of Death. Qatar, given their size, talent, and experience, are expected to give Kazakhstan (and many other teams) quite a difficult time in the FIBA Asia Championship. They have currently been sighted in Manila, playing a couple of PBA clubs in tune-up games before flying out to China for the real thing. Mohammed Yousef, Khalid Suliman Abdi, and Trey Johnson are the ones expected to carry this team in the expected absence of Yaseen Musa and Mansour El Hadary. Lebanon were expected to join the Philippines, Chinese Taipei, and a New Zealand club in the four-nation MVP Cup in Manila, but they reportedly backed out in favor of joining the four-nation tourney in China, from which they also backed out. Additionally, iconic player Fade El Khatib’s release from his CBA club hasn’t reached a resolution yet. In short, the Cedars are in limbo. Yes, Palestine got plastered by Jordan in a couple of tune-up games, but they can only get better, right? They fly to China to join the hosts, Jordan, and the UAE in a four-nation competition that should give the Palestinians an opportune time to continue jelling as a team. This is still a potentially dangerous squad when the FIBA Asia Champinship begins. This competitive and perhaps underrated team has, like Qatar, been spotted in Manila, playing against a couple of PBA clubs in tune-up contests. Kuwait should benefit greatly from that, but that won’t address their biggest problem — the lack of size. This team reportedly has just one player standing taller than 196cm (6ft 5in). Yikes. Nothing much from India except for the fact that they have no confirmed head coach yet and two rival factions threaten the stability of their national federation. Still, with both Amjyot Singh and Amrit Pal Singh being signed anew by a Japanese semi-pro team, one cannot deny that there is talent here to maybe spring a couple of upsets. With not much coming out of Hong Kong about their team’s preparations for the FIBA Asia Championship, it’s reasonable to suspect that they won’t fare as well as they did in 2013, when they managed to advance to the second round. Even if they bring in guys like 204cm (6ft 9in) Duncan Reid, Fong Shing Yee, Lo Yiting, and Lee Ki, it’ll be tough for Hong Kong to make any sort of splash in China. Unbeknownst to many, Malaysia were the second-best team in the 2015 SEABA Championship, and though they’re young and raw, the Malaysians are still hoping they can maybe spring a surprised in a game or two. To say that it’s highly unlikely, however, is a gross understatement. Coach Neo Beng Siang is ruing the fact that he can barely have enough people to have a scrimmage in practice. This team was very far from being the strongest already, but hampered training camp only serves to make things worse.